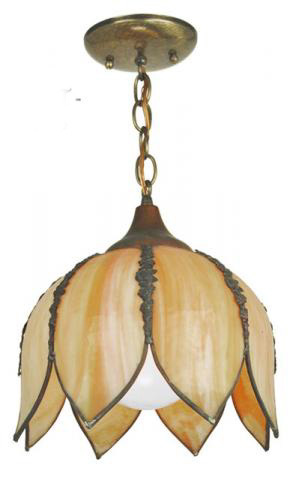 There was a time back in the 1950's that these shades were reproduced for the Victorian market. Not a lot of them survived but some of them were made pretty darn well. We believe that this is one of those shades which gives a nice ambiance. To make one of these is not so easy. First you had to have the art glass sheet. Then you had to cut each blank to size. Next was the "slumping" process where the flat cut out piece is laid up on a die that takes the shape you wish to create. It is put into a high temp oven and allowed to almost melt. The glass becomes soft and sags...or "slumps" over the die that has the shape you wish to create. After the slumping process, annealing takes place so it does not shatter when it cools and then some edge grinding and finally assembly. Not all the glass pieces survive. Measurements: 17 1/2" tall but could be lengthened by adding chain links, or...reduced to as little as 13" by removing all but one link. The shade has an 11" diameter and takes one 100 watt bulb.